Breaking Bad recently wrapped up its fourth season, leaving us despondent that it will be a good couple months until we see the further misadventures of cancer victim/chemistry teacher/crystal meth chef Walter "Heisenberg" White and his brash partner Jesse Pinkman. While we twiddle our thumbs in anticipation for Season 5, here are 10 times Breaking Bad flaunted its chemistry for nefarious purposes. There are some pretty significant spoilers ahead, so don't say we didn't warn you. After the twin psychological duresses of terminal cancer and slinging meth begin to sink in, Walt entertains himself by inserting a moist sponge into an obnoxious man's car engine. This is more automotive shenanigans than chemistry, but Bryan Cranston sells Walt as a haunted man toying with his dark side. When the RV's battery dies in the middle of nowhere, Walt and Jesse must build something to start the engine. On the verge of fatal dehydration, Walt constructs salvation out of found materials. When the cartels force Jesse to travel south of the border to cook up his patented Blue Sky methamphetamine, the surly young meth chef is confronted by a group of dubious Mexican chemists. After they doubt his credentials, Jesse shoots back by demanding better workplace standards. To steal a barrel of methylamine from a guarded warehouse, Jesse and Walt crack open a few Etch A Sketches, purloin the aluminum powder inside, and whip up a batch of thermite to burn through security. I'm assuming Bruce Wayne is a major stockholder in the Ohio Art Company, as Batman always seems to have plenty of unsuspicious thermite lying around. When Walt and Jesse realize that they've hitched their apple cart to mentally unstable drug kingpin Tuco Salamanca, Walt synthesizes ricin from castor beans, laces it with a batch of meth, and offers it to the meth-happy Tuco. 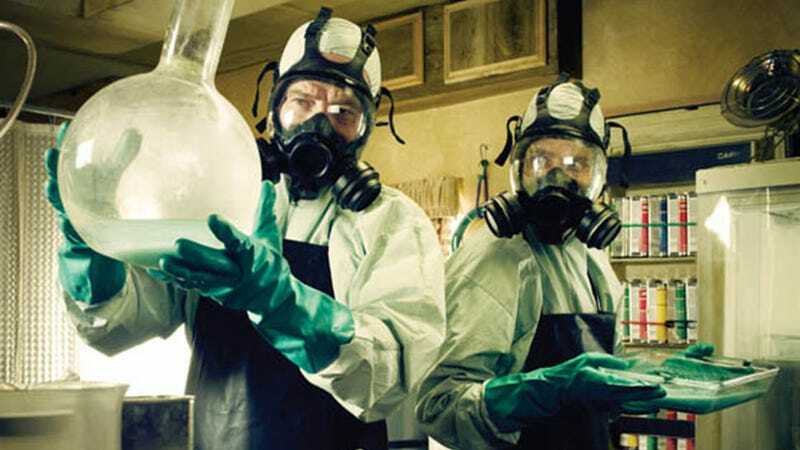 After Tuco complains that the ricin meth stinks like "head cheese," Walt adds it as a garnish to his burrito. This plan goes about as well as you'd expect. The burrito wasn't the first time Walter used chemistry to tussle with Tuco. Several episodes earlier, the drug lord had robbed Jesse, so Walt cooks up some Mercury Fulminate for a hostage situation. The depiction of the explosive was embellished for the episode, but it's one of the first times we see Walt go into 100% bugfuck "Heisenberg mode." There were a few shockers in the Season 4 finale, but the revelation that Walt poisoned innocent little kid Brock to break Gus Fring's spell on Jesse was a jaw-dropper. After using Lily of the Valley to put Brock in the hospital, Walt's officially past redemption. Here's a play-by-play of his actions. During the very first episode, drug dealers force Walt into revealing his recipe for meth. Rather than give up his secrets and die in the desert, he intentionally creates phosphine gas to kill his captors. Whenever the protagonists on Breaking Bad need to dispose of a corpse, they usually shove the dead person in a barrel of hydrofluoric acid. The first time Jesse tries this, he fails miserably. To quote Walt, "Hydrofluoric acid won't eat through plastic. It will, however, dissolve metal, rock, glass, ceramic. So there's that." "Over" is a spectacular episode, as it shows Walt trying to balance his family obligations with his increasingly dominant Heisenberg persona. In the episode's final scene, he meets a novice meth chef in a home supply store. At first, Walt gives the confused cook some avuncular tips straight out of high school chemistry class. But after a moment of reflection, Walt metamorphoses into Heisenberg, and he utters the grimiest five words of the entire series. TV on the Radio makes this scene. BONUS: Apropos of nothing, Gale Boetticher's full karaoke video! Thanks, SkippityMonster!